The Mount Feake Cemetery, along the Charles River in Waltham MA is a hidden gem among the rich collection of historic garden cemeteries in the Boston area. It was a wonderful place to explore on a relatively mild (upper 30's) and extra sunny Monday December 30th. 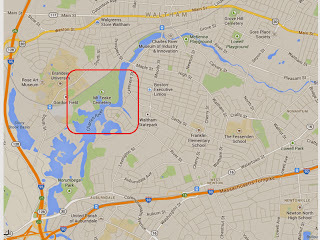 Smaller, and with fewer large structures than Mount Auburn Cemetery (the granddaddy of them all), it has something that Mount Auburn doesn't: a dramatic and expansive riverfront. It shares many features: a rolling topography, winding roads and paths, a varied collection of large trees, with an expansive layout to allow their full appreciation. The light on this sunny midwinter afternoon was strong, with sharply slanting shadows. The river widens out here, with mini-bays adding visual interest. The photo below is taken looking out from peninsula made by one of these small bays. Here is one of the more elaborate monuments, a certain Mr Shepherd. The statue has suffered the same fate as busts in a park above Rome, where the noses have been vandalized away, along with some of his fingers. It is a well-executed statue that looked good in the afternoon light. A large square stone erected by the Waltham Watch Factory commemorates D. H. Church, Master Watch Maker and Innovator, and his wife. The historic watch factory buildings are still standing, across the river (photo below). I thank Sheldon Brown for posting a link to an 1881 Scientific American article on the Waltham Pocket Watch in his journal from August 14, 2007. We miss you Sheldon. 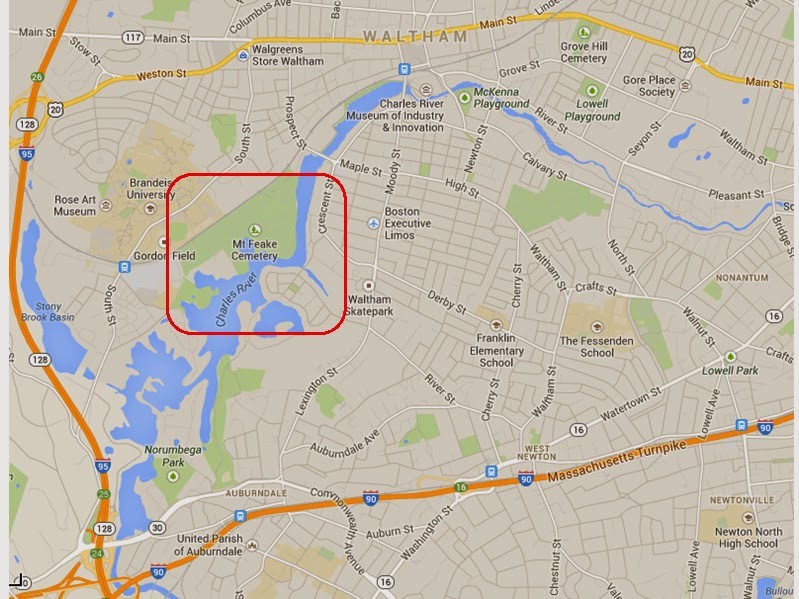 Parking in Waltham center, such as in the municipal lot near Ristorante Maracellino, the Mount Feak Cemetery can be reached by a pleasant 1 mile walk along the Blue Heron Trail (paved). On the way back along the path, these Canada Geese were walking, nearly single file, on the river ice, marching to shore for the evening. The receding sunlight lit the scene in a magical and memorable way. Great photos, Joe, especially the one from the peninsula. Incidentally, Obed Shepherd was a dry goods merchant and holder of real estate. He, with others, started the Waltham Trust Company.